Over time, businesses have defined success by one factor: profitability. ​While that hasn’t changed completely, in more recent years the role of business has evolved as leaders have been focused on creating a greater positive impact. 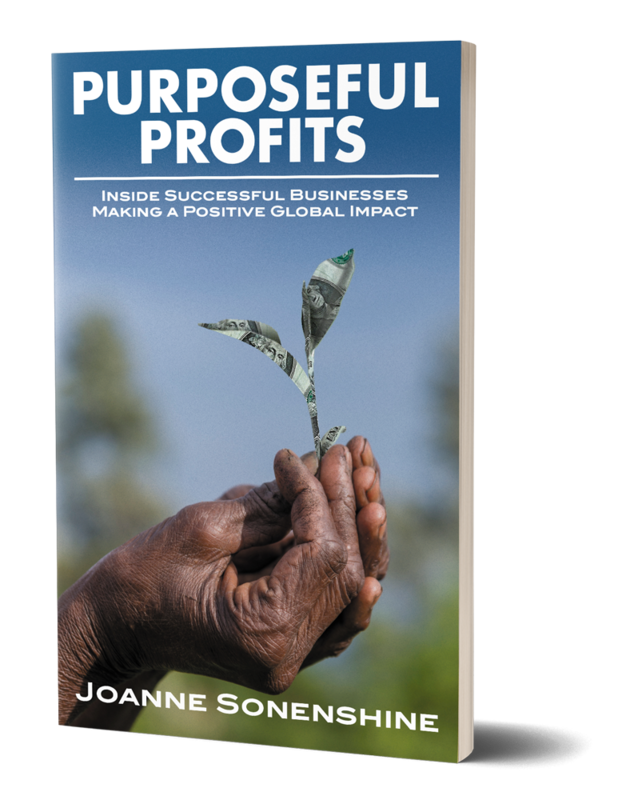 Read the story behind Purposeful Profits. Purposeful Profits provides first-hand accounts from those working inside successful companies, large and small, local and global, as to how this evolution has taken shape, what it means for the future of business profitability, and why being a business that is purpose-driven is as important as any other measure of success. ​Joanne Sonenshine shares these stories to showcase how decision making with empathy and purpose can transform a corporation from one solely seeking to make money, into one that is successful both for its profits, but also for its impact. ​Sometimes it seems overwhelming to set a far reaching social, economic or environmental impact goal, especially without sacrificing profit. How can a company be mission-driven AND profitable? Joanne will discuss how in 6-steps, it’s possible to be a mission-driven AND profitable business leveraging partners and networks. Being mission driven must come from all sides within a business. The mission must be felt top down and bottom up. If there isn’t buy in from employees, impact is slower to come by. Joanne will share her thoughts on how to create impact goals from effective organizational consensus building so a company can operate successfully and purposefully. Joanne will share excerpts from her book, inspiring audiences to think differently about working towards a mission-driven business outcome. Where possible Joanne will bring a guest with her to share his/her story of driving purposeful profits from within. As a partnership and collaboration strategist, Joanne helps companies, nonprofits and governments evaluate impact and success by working with partners. Joanne can share examples of effective partnerships for impact, and highlight how collaboration makes purpose even more profitable.